A solfatara is a small crater or vent in Earth's surface through which steam and gases, at relatively low temperatures of 100–300°C, escape. 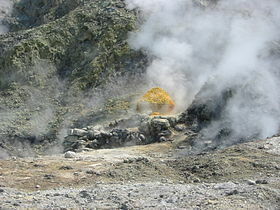 Solfataras occur mostly in volcanic regions and many of the gases released by them, including hydride sulfide, contain sulfur. They are a type of fumarole typically found in an area of declining volcanic activity.